Humboldt, an early 19th century biologist (near and dear to my heart), is credited with sparking the discipline of comparative mapping. His map of the distribution of the flora on a South American mountain is handsome, and may have inspired the early comparative publishers, but it is not a comparative, rather it is a profile or elevation. Whereas a map is, broadly speaking, a simplification of physical features to promote understanding, it no doubt qualifies as a map; it shows the distribution of plant life across the face of the mountain. Insofar as a comparative map is the rearrangement of physical features by some trait, usually size, to further promote understanding of geography, it is not a comparative. This map is certainly an great example of early thematic mapping. Thematic mapping is the plotting of non-topographical features on a map and differs from general mapping which shows terrain, boundaries, etc. Moreover, it is an innovation in thematic mapping, being the first to my knowledge to apply thematic principles to a profile, plotting plant life as the occur on the mountain side. 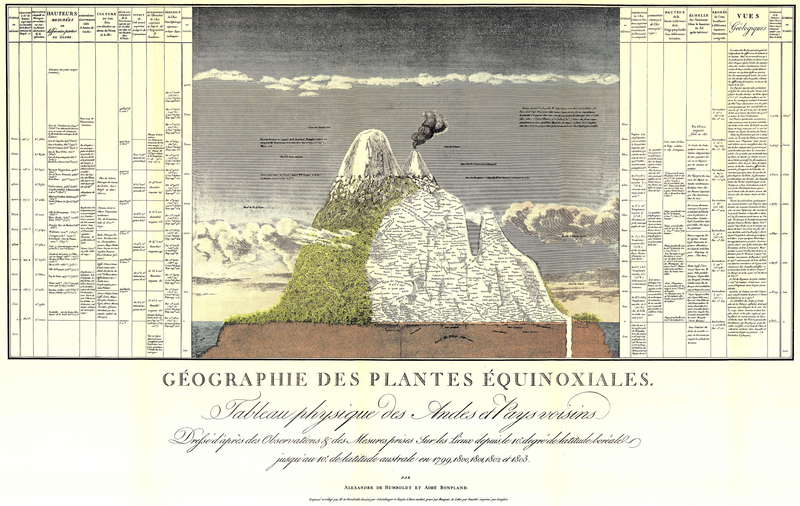 The features on this map, a single mountain and the plants on it are arranged as they are actually encountered on the earth, violating the first criterion for comparative mapping; the features on a comparative map must be arranged so as to highlight the differences in a particular trait, usually size. On the other hand, this map hints at the importance of comparisons, and may well have encouraged subsequent development in the genre by showing the heights of other mountains in the margins. To be sure, the heights of other mountains are not shown pictorially, again violating a tenant of comparative mapping, but the idea is there. Importantly, his map made waves beyond mapping styles. It changed the way scientific data was displayed. I have it in my mind that he published this in a journal, but having just looked for the title, in not certain whether it was a journal or a standalone article. Check out this link: http://cybergeo.revues.org/25478 If not the whole thing, scroll down and look at a few more of his illustrations. What a well-traveled and prolific scholar. I have often heard his name, but have really paid proper attention to the scope of his works. Thanks for the link.